In the middle of the beef crisis in the UK during the nineties, beef joints including the animal’s bones were banned. You couldn’t buy proper roasting joints anywhere. All beef was sold off the bone, and that was that. My dad had other ideas, and wasn’t about to be scared off by a minor inconvenience such as CJD. He knew people, he worked in the trade. One weekend, for some family get together or other, he came home with an enormous joint, at least six or seven ribs wide, it must have weighed about four kilos, on the bone. He’d asked the butcher for a joint prepared ‘in the traditional way’, and no further questions were asked. It was magnificent, and sat in the middle of the table as we weighed up whether or not to take the risk of eating it. The contraband beef won in the end, and it was the best beef I’ve ever had. This Abel & Cole joint wasn’t far off, either, and this time we benefited from our dinner being totally legal. To roast a beef joint properly, you only need four things – a good joint, salt, pepper and an eye on the clock. The hardest part is choosing the joint. My cut of choice is the forerib, or rib of beef. It comes from just above the brisket, and normally has three to five ribs left in. The ribs are vital. They give the joint flavour and support, protecting the tenderest of the meat from the fiercest of the heat. The quality of the beef itself is also vital. If you’re going to roast a large joint, it should be a good one, from a cow that’s been well looked after and farmed properly. This joint was farmed in Herefordshire by a 78-year old farmer called David Powell. It’s from a Hereford steer, one of an award-winning herd headed by a 22-year old calving cow called Pru. Abel & Cole do go a bit overboard on the provenance of their food, you may have noticed, but it’s good to know the little things. The 1.6kg joint was seasoned liberally and given twenty minutes at 220c and a further forty-five minutes at the more sedate 170c, resting for another twenty minutes afterwards. This left the joint with a rich, pale red colour in the centre, moist and tasty. The timings are from Hugh Fearnley Whitingstall’s unparalleled River Cottage Meat. Hugh spends five pages describing the process of roasting a joint in minute detail. It’s a joy to read something written with such knowledge and enthusiasm, but in a nutshell, Hugh’s advice is to blast the meat at a high temperature for twenty to thirty minutes, then reduce the heat to a lower setting for a further fifteen minutes per half kilo for a perfect medium roast. These timings, or anything else in River Cottage Meat for that matter, never fail. 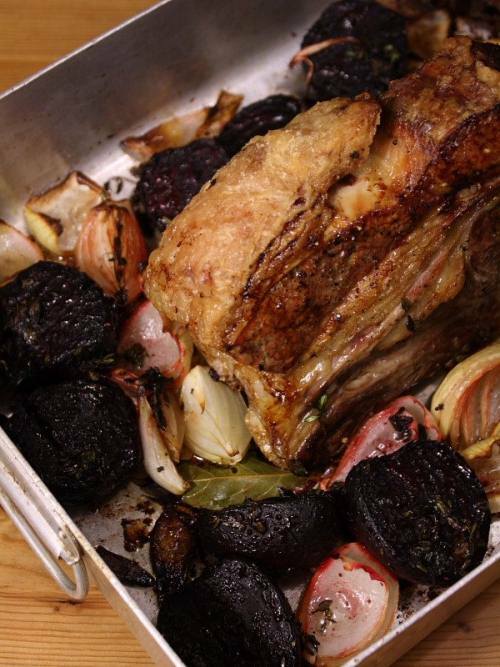 The beef was cooked with beetroot and onions. Beetroot is an excellent partner to beef, especially when roasted itself, with some gutsy herbs and a heavy hand with the seasoning. Boil four or five beetroot gently in their skins for about forty minutes until just done. Peel and halve them. Peel and quarter a similar number of small onions, and add them to the beetroot with plenty of salt and pepper and a couple of tablespoons each of thyme and marjoram leaves. Add a big glug of olive oil to coat the vegetables, and tuck them around the beef for the last half an hour or so of cooking, finishing off whilst the beef rests. Slice the beef into thick slices and serve with the roasted vegetables, and some horseradish sauce or mustard. The beetroot will be warm, tender and sweet, the onions rich and caramalised, the beef rich and pink. One last thing. If you’re going to roast a big joint of meat, make sure it’s far too big. You need to have some left over for sandwiches the next day, or even to just slice straight off the bone in the middle of the night. Thanks to Abel & Cole for sending me this joint – your beef is superb. I too have tried some wonderful Abel & Cole meat, including rib of beef. Agree it's the most wonderful cut, so full of flavour and lots of fat to keep the meat juicy! First of all..love your stories —-and wow, this dish makes me want to start defrosting my beef in the back freezer and copy this …Thanks! Lovely and informed post; it's good to hear about the particular cuts of meat and why they make for good eats. Fantastic – rib is my cut of choice too and I follow religiously Hugh's advice on cooking it. It never fails – the half hour blast of heat then the steady finish delivers perfect results every time. I have found the addition of a meat thermometer in the process helps deliver absolute accuracy for the beef perfectionist! I should try Abel and Cole – we have a great local butcher in Pudsey who hangs his beef for 4 weeks and it is absolutely beautiful. I have hung it for up to 6 weeks and it actually gets better (although whiffs a bit on the outside). Joy. Phil – I need to get a meat thermometer… My local butcher, Binns in Saltaire, regularly has some superb beef in, equal to this A&C cut. They have their own farm up near Bolton Abbey, and seem to be farming a lot of Aberdeen Angus at the moment. It's absolutely wonderful beef. Let me know which butcher in Pudsey you use…always on the lookout for new suppliers! Kavey – I really like A&C's meat. It's onsistently good quality. Dining with Batali – thanks! Get that joint defrosted…it'll be perfect with some beetroot. Wasabi Prime – thanks. Do try the forerib – it's a stunning cut. Great story and yummy looking dish! I have always been more than delighted with Abel & Cole meat. There is nothing quite like a forerib of beef on the bone – wonderful.